Spiny Amaranth (Amaranthus spinosus) is a dicot weed in the Amaranthaceae family. In Mississippi this weed first evolved resistance to Group G/9 herbicides in 2012 and infests Cotton. Group G/9 herbicides are known as EPSP synthase inhibitors (Inhibition of EPSP synthase). Research has shown that these particular biotypes are resistant to glyphosate and they may be cross-resistant to other Group G/9 herbicides. Greenhouse trials comparing a known susceptible Spiny Amaranth biotype with this Spiny Amaranth biotype have been used to confirm resistance. For further information on the tests conducted please contact the local weed scientists that provided this information. There is no record of differences in fitness or competitiveness of these resistant biotypes when compared to that of normal susceptible biotypes. If you have any information pertaining to the fitness of Group G/9 resistant Spiny Amaranth from Mississippi please update the database. The Herbicide Resistance Action Committee, The Weed Science Society of America, and weed scientists in Mississippi have been instrumental in providing you this information. Particular thanks is given to Vijay Nandula for providing detailed information. Molin, W. T., V. K. Nandula, A. A. Wright, and J. A. Bond. 2016. Transfer and expression of ALS inhibitor resistance from Palmer amaranth (Amaranthus palmeri) to an A. spinosus × A. palmeri hybrid.. Weed Science 64 : 240 - 247. Transfer of herbicide resistance among closely related weed species is a topic of growing concern. 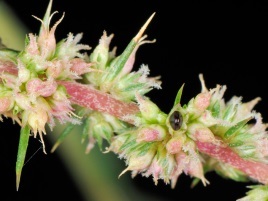 A spiny amaranth × Palmer amaranth hybrid was confirmed resistant to several acetolactate synthase (ALS) inhibitors including imazethapyr, nicosulfuron, pyrithiobac, and trifloxysulfuron. Enzyme assays indicated that the ALS enzyme was insensitive to pyrithiobac and sequencing revealed the presence of a known resistance conferring point mutation, Trp574Leu. Alignment of the ALS gene for Palmer amaranth, spiny amaranth, and putative hybrids revealed the presence of Palmer amaranth ALS sequence in the hybrids rather than spiny amaranth ALS sequences. In addition, sequence upstream of the ALS in the hybrids matched Palmer amaranth and not spiny amaranth. The potential for transfer of ALS inhibitor resistance by hybridization has been demonstrated in the greenhouse and in field experiments. This is the first report of gene transfer for ALS inhibitor resistance documented to occur in the field without artificial/human intervention. These results highlight the need to control related species in both field and surrounding noncrop areas to avoid interspecific transfer of resistance genes..
Gaines, T. A. ; Ward, S. M. ; Bukun, B. ; Preston, C. ; Leach, J. E. ; Westra, P.. 2012. Interspecific hybridization transfers a previously unknown glyphosate resistance mechanism in Amaranthus species. Evolutionary Applications 5 : 29 - 38. A previously unknown glyphosate resistance mechanism, amplification of the 5-enolpyruvyl shikimate-3-phosphate synthase gene, was recently reported in Amaranthus palmeri. This evolved mechanism could introgress to other weedy Amaranthus species through interspecific hybridization, representing an avenue for acquisition of a novel adaptive trait. The objective of this study was to evaluate the potential for this glyphosate resistance trait to transfer via pollen from A. palmeri to five other weedy Amaranthus species (Amaranthus hybridus, Amaranthus powellii, Amaranthus retroflexus, Amaranthus spinosus, and Amaranthus tuberculatus). Field and greenhouse crosses were conducted using glyphosate-resistant male A. palmeri as pollen donors and the other Amaranthus species as pollen recipients. Hybridization between A. palmeri and A. spinosus occurred with frequencies in the field studies ranging from <0.01% to 0.4%, and 1.4% in greenhouse crosses. A majority of the A. spinosus × A. palmeri hybrids grown to flowering were monoecious and produced viable seed. Hybridization occurred in the field study between A. palmeri and A. tuberculatus (<0.2%), and between A. palmeri and A. hybridus (<0.01%). This is the first documentation of hybridization between A. palmeri and both A. spinosus and A. hybridus..
Carvalho, S. J. P. ; Buissa, J. A. R. ; Nicolai, M. ; López-Ovejero, R. F. ; Christoffoleti, P. J.. 2006. Differential susceptibility of Amaranthus genus weed species to the herbicides trifloxysulfuron-sodium and chlorimuron-ethyl. Planta Daninha 24 : 541 - 548. The susceptibility of the following Amaranthus species to post-emergence applied herbicides was evaluated: A. deflexus, A. hybridus, A. retroflexus, A. spinosus and A. viridis. The herbicides were: trifloxysulfuron-sodium and chlorimuron-ethyl. Herbicides were applied on plants with 5-6 leaves and rates of 0, 16R, 4TR, 1/4R, 1/16R, 1/64R. The rate (R) for trifloxysulfuron were 3.75 and 7.5 g/ha, while this was 12.5 and 17.5 g/ha for chlorimuron, during the first and second phase, respectively. In the first phase, percentage control and dry mass of the pots were evaluated at 20 days after application, while in the second, percentage control was evaluated. A. deflexus was the least susceptible, followed by A. spinosus, A. viridis, A. hybridus and A. retroflexus..
Ferreira, E. A. ; Procópio, S. O. ; Silva, E. A. M. ; Silva, A. A. ; Rufino, R. J. N.. 2003. Leaf anatomical studies in weed species widely common in Brazil. IV - Amaranthus deflexus, Amaranthus spinosus, Alternanthera tenella and Euphorbia heterophylla. Planta Daninha 21 : 263 - 271. This research aimed to study the leaf anatomy of the weed species Amaranthus deflexus, Amaranthus spinosus, Alternanthera tenella and Euphorbia heterophylla, widely known in Brazil, to acquire a better understanding of the barriers each species imposes to herbicide penetration, and to other substances used for leaf spraying. Completely expanded leaves from the third to the fifth nodes were collected from spontaneous plants in the field. Three samples approximately 1 cm2, were removed from the medium portion of the leaves, from each species. These samples were used for structure, clarification and scanning-electron microscope observations. All species were amphistomatic. The potential major leaf barriers to herbicide penetration in Amaranthus deflexus and Amaranthus spinosus were, respectively, high cuticle thickness in the adaxial side and high cuticle thickness in both sides, respectively, whereas in Alternanthera tenella, high cuticle thickness on both sides, high content of epicuticular wax and high trichome density were the major potential barriers observed. E. heterophylla showed high content of the epicuticular wax, high latex glandular density and high cuticle thickness in the adaxial side as possible major barriers to herbicide penetration..